Some readers might remember my astonishment earlier this year at the fact that confusion between the English “R” and “L” didn’t only occur when those hailing from East Asian countries attempted to speak English. In fact, it happened as well in between English and Spanish, the latter being the language I’m most familiar with beyond my native tongue. I myself thought of the pair miracle and milagro, while Bradshaw of the Future author Goofy pointed some more: peregrine and pilgrim, azul and azure. Just the other day, while gazing adoringly at my “garden” — by which I mean the narrow balcony ledge that I chose to clutter with potted plants — another one occurred to me: cilantro and coriander. More often than not, people seem to not know that cilantro — the herb most familiar in its leaf form — and coriander — the spice most familiar in its seed form — both come from the same plant, Coriandrum sativum. The connection is only apparent when you turn the “R” in coridander into and “L” or the “L” in cilantro into an “R.” You get coliander — which could become colandro in the same way the name Leander becomes Leandro in Spanish — and then, fairly easily, cilantro. Or you get cirantro, which is just one vowel syllable away from ciriantro, which isn’t all that far form coriander. 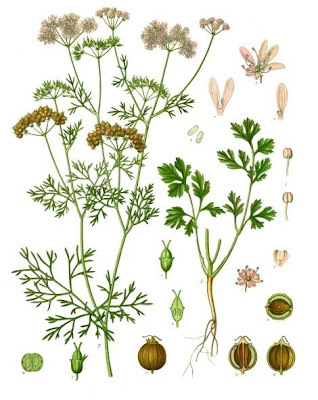 Even better: The Online Etymology Dictionary notes that coriander descends from the Greek koriannon, which is apparently a non Indo-European word. This blows my mind even though it shouldn’t. Greece isn’t all that far away from lands whose inhabitants speak non-Indo-European languages, so it make sense that it would have picked up some outliers. However, I feel like the words I write about on this blog are almost exclusively Indo-European in origin, so this makes the coriander/cilantro discovery all the more exciting. The Wikipedia page on the subject notes that the Mycenaean form of the word comes is koriadnon, which is similar to the name of the mythological damsel Ariadne. Not sure exactly what I’m to make of this alleged connection, but it makes me recall the fact that the real name of Teen Titans superheroine Starfire, Koridan’r — who, like Ariadne, is princess. A meaningful connection? Probably not. But just a bit more to think about on top of what I’m already turning over in my head. There are 6 non-Indo-European languages spoken in Europe today, but in the past the number was much higher. Most of them have died out, but they've left remnants... for insance a large number of Germanic words can't be traced back to PIE, presumably they were borrowed from a non-IE language. Very interesting, as a lot of post I've read here... Keep the good work. Regards. PS: Spanish is my mother tongue, btw.